Assessing large scale environmental risks for biodiversity with tested methods ALARM was essentially a project to improve the instruments for assessing the threat to and the loss of biodiversity in Europe, and on this basis to derive suggestions how to stop the negative trends. 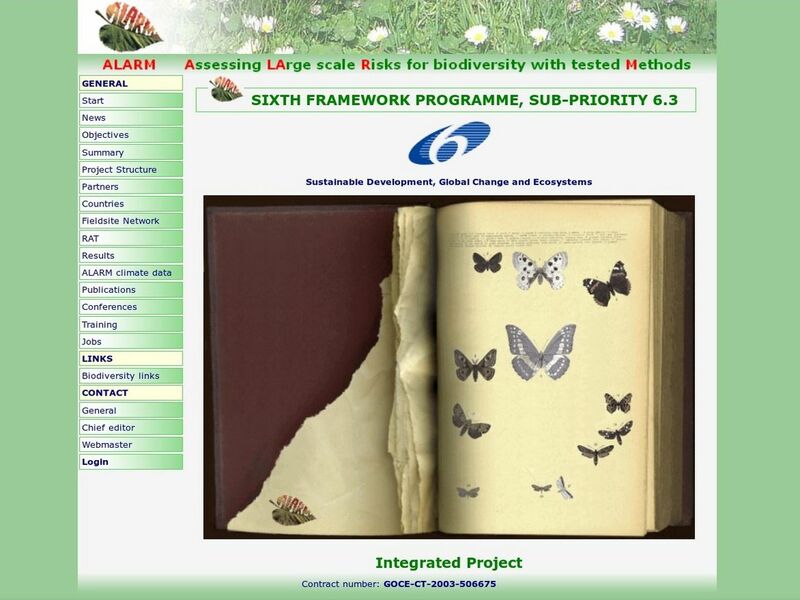 Based on a better understanding of terrestrial and freshwater biodiversity and ecosystem functioning ALARM developed and tested methods and protocols for the assessment of large-scale environmental risks in order to minimise negative direct and indirect human impacts on biodiversity. Research focused on assessment and forecast of changes in biodiversity and in structure, function, and dynamics of ecosystems resulting from the interaction between society, economy and biodiversity. In particular, risks arising from climate change, environmental chemicals, biological invasions and pollinator loss were assessed. The ALARM consortium combined the expertise of 54 partners from 26 countries, including research on climate change, land use patterns environmental chemicals and biodiversity. Socio-economics as a cross-cutting theme contributes to the development of driver-specific risk assessment tools and methods and develops instruments to communicate risks to biodiversity to end users, and to indicate policy options to mitigate such risks. The team analysed the socio-economic drivers behind biodiversity loss, and derives strategies aiming at reducing different kinds of biodiversity pressures as means of coherent policy orientation. developing recommendations for political and socio-economic measures to reduce the negative impacts of climate change on biodiversity. For this purpose different socio-economic scenarios were developed and linked to the existing IPCC climate change and land use scenarios and the scenarios that were defined by the natural scientists throughout the project. These scenarios provided the base for model runs which can show the impacts of political measures given different scenarios and trends. These impacts help to underpin the scientific findings in the climate research and lead together with those as well as with the results of the other project modules to recommendations for political reforms. SERI was coordinating the socio-economic research in ALARM (Joachim Spangenberg) and collaborated in analysing the relation of economic policies, climate change and biodiversity loss. (Ines Omann, Andrea Stocker).